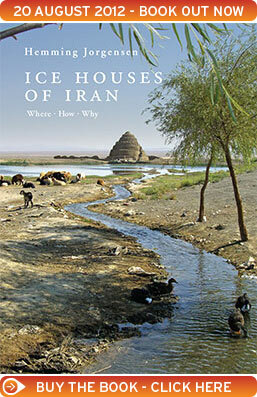 Ice Houses of Iran awarded "Book of the Year Award"
Hemming Jørgensen's book, Ice Houses of Iran has been awarded 2015 Book of the Year in Iran. Prior to the research work on the ensuing dissertation of Hemming Jorgensen no particular and comprehensive study of the Iranian ice houses had been carried out. Due to the continental climate on the Iranian Plateau, with hot summer days and freezing cold winter nights, the Iranians have since the Antique been able to produce ice in open basins and store it in protected ice pits, the so-called ice houses, for use in the scorching hot summers. An important pre-condition for making ice was of course the availability of fresh water. Thanks to the ingenious tunnel systems – qanats – the Iranians have for almost three thousand years conveyed water from the surrounding mountains into the desert plains and established villages with irrigated agriculture and during winter used the surplus water for ice making.